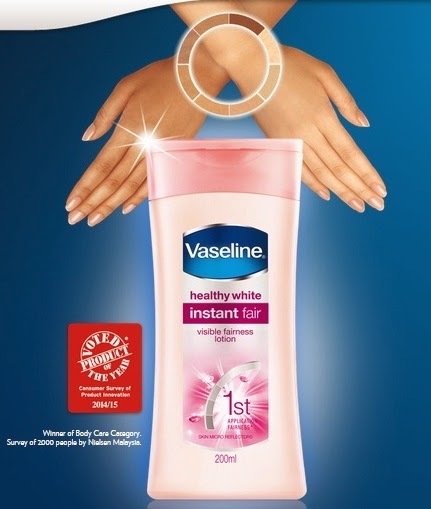 Vaseline Instant Fair Lotion is the newest member of Vaseline’s extensive line of products. It is an instant whitening lotion that allows for fairer and even-toned skin in just one application. Vaseline is able to ensure the effectiveness of their product not only because of the careful research, and testing that all Vaseline products go through, but also because Vaseline knows their consumers’ skin best. The main ingredients to the success of this product are Microreflectors that allow for instant fairer skin. Vaseline Instant Fair Lotion also has the renowned Vitamin B3 that give long term and healthy whitening and has triple sunscreens for protection against the sun’s harmful UVA and UVB rays.an exclusive patented Chanel technology.